Since I created the silicon mold for Shalamayne's hilt gems, I've created a couple of gems. They are not perfect, I think I'll be sanding then polishing them in order to produce smooth sides. I'll likely use some spray acrylic paint as well, I've read several tutorials that mention the spray to protect against finger prints. I successfully donned the armor over Thanksgiving break. The shoulder pads rest in place rather easily and allow for quite a bit of arm movement. 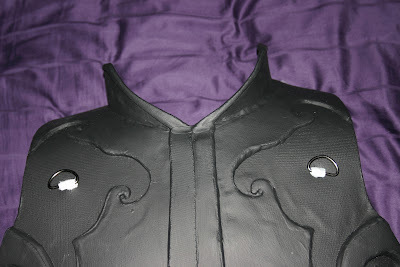 The picture shows that I need to fix the armor collar on the right side. Not quite sure of how I'll do that yet. I have cast a few gems using the mold I created, I will post a few pictures of those soon. I took the sculpted red gemstone for Shalamayne's hilt and created a silicon mold so I can cast gems in translucent red resin. I used Tap Plastic's RTV silicon, it was much more viscous than I expected, next time I'll need to use more rigid mixing containers. I built the mold using the top of a drink cup and the lid of an old container. I used hotglue to seal the cup to the lid, then a dab of hot glue to secure the gem in nearly in the center. For my first attempt at a mold I think it turned out pretty well. There was a little leakage around the edge of the gem, so the very bottom edge of the gem will be uneven, but that part will be hidden when the gem is incorporated into the sword. 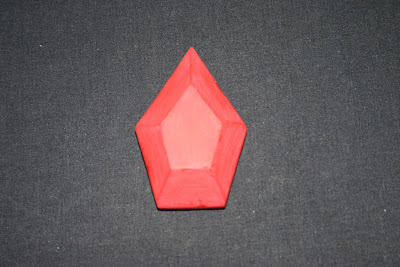 I completed sculpting the red gem for Shalamayne's hilt. I used 320 grit sandpaper to smooth the facets and try and give the edges a sharper look. I am going to do a little wet sanding with 400 grit sandpaper before I create a silicon mold. The better the surface now, the better the cast gem will look. 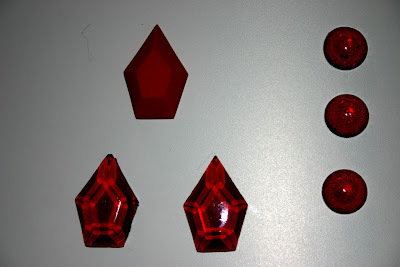 I plan to cast two red tinted clear gems, I might create a second pair with LEDs embedded in them. Not sure what to call them, but Varian Wrynn has two lion head brooches, cloak pins? That hold his cape in place. Well, after about two days, I finished sculpting a lion head medallion from Sculpty. They are shown as octagons in-game, but most of the concept art I have seen show them as circular, I think I can alter them slightly to circles if need be. I will be using this as the positive to create a mold and cast this in resin. I am going to research what sort of resin would be best for this. Unfortunately, it doesn't look like I can finish the Varian Wrynn costume in time for Blizzcon. There are so many little details left to make plus the wonderflex I was waiting on to finish the shinguards and build the bracers hasn't arrived. The biggest reason is there is a lot of painting to be done and no time for it to dry or cure. So I'm going to have to save this costume for next year, on the plus side that gives me a twelve months to finish it. 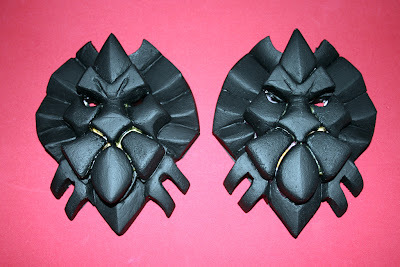 The lion faces for the Knee part of the shin armor are being primed, they will need a coat or two more before sanding. The harness to hold the shoulder armor in place is nearing completion. 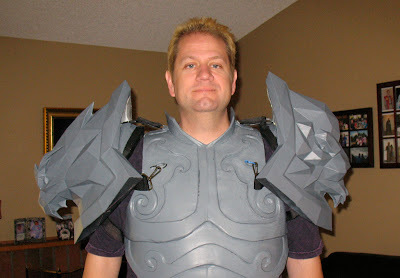 I need to trim the outer part of the shoulders so it doesn't interfere with the way the armor sits. Then I need to add rings to fix the armor to the harness. I have begun painting Shalamayne. I rigged my mini-paintbooth with a base so the blade can stand up. The photo is after two coats of silver spray paint. The shoulders are primed, need to sand them smooth and start painting. I think I will go with a blue spray paint base and a dark yellow spray trim. Once the base coasts are on, I'll put in details with light blue and lighter yellow and gold for the highlights. The breastplate is also primed and ready for sanding. I know I want to go with a dark blue base coat, then various levels of silver on the highlights, but I'm not sure if it will be spray paint or acrylics. I plan to use the same techniques for the gold trim on the armor as I use on the shoulder. I did a lot of sanding over the weekend, I didn't take many photos of the sanded items, but I do have this nice pic showing the leather portion of the belt with the primed buckle. The leather will be stained a darker brown, fur trim needs to be attached to the top and bottom, and of course finishing the paint job on the buckle. I should have more pictures up soon. Varian's shoulder armor pieces are relatively light for their size, but still bulky and heavier than many such costume pieces. I struggled with the idea about how best to secure them so they are wearable, but not to confining. And I didn't want them to just fall off either. So I designed a shoulder harness using scrap leather. 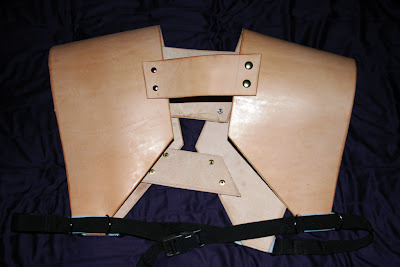 The shoulder pads will connect to the harness and the armor breastplate will be worn over the harness. The fur should hide this all from sight. I finished scuplting the second lion knee armor piece. I tried something different by filling the gaps with the paper-mache paste I used for the inside of the shoulder pieces. Hopefully it won't take to long to dry. 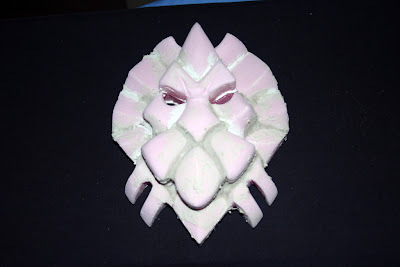 I finished the sculpt of one of the two knee guards out of pink foam. The knee uses the same basic shape as the belt, but is slightly larger. Next I'll be filling the gaps with putty and priming it. Then duplicating the same effort for the other knee. I also finished rigging up the straps to hold the breastplate on. All the straps connect to a belt around the waist. 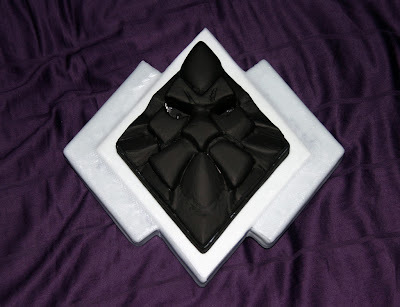 With the foam inside the Shoulders carved out, I started work early Saturday morning on finishing the foam surface. I covered the foam with tape. Then I used mod podge to cover the tape in small squares of newspaper. 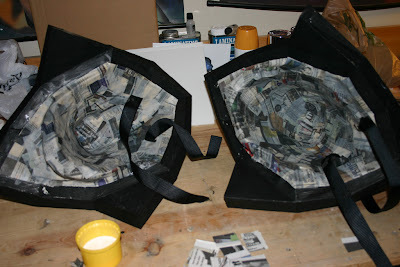 The plan is to then cover the newspaper with paper-mache. I had hoped to complete the step by Sunday, but the paper was still damp so that is on hold until Monday evening. The size and weight of the shoulder pieces make it a challenge to create a way to wear them. I decided to add a pair of D-rings to the breastplate to help stabilize the shoulder pads. 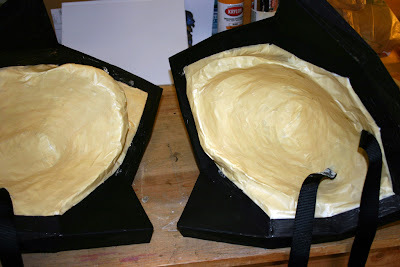 I filled the fiberglass shoulder pieces with expanding foam, the carved out a hollow for my shoulders. 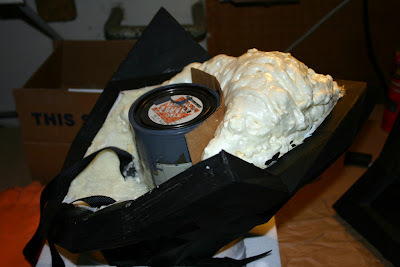 Next I'll use some papermache to finish off the foam and allow me to paint it. 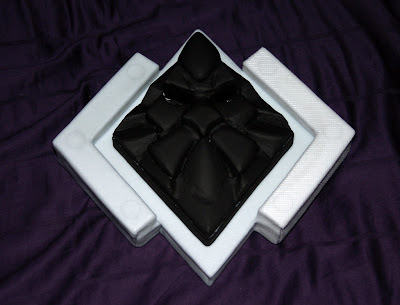 I am going to put softer foam in there to act as both cushioning and to allow more movement. 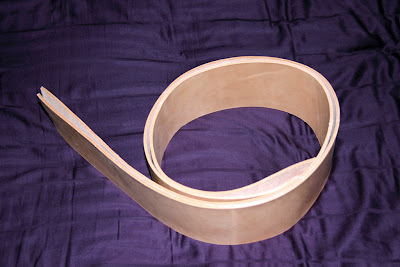 Work continues on the belt, on Wednesday I cut two long strips of leather about four inches wide. I'll be finishing the edges and dyeing the leather a darker brown for Anduin Llane's belt. Spent a lot of time last night working on the shoulder pieces. I am attempting to use expanding foam inside the fiberglass pieces, carving out the space I need so they will rest on my shoulders. It is proving to be a bit more of a challenge than I initially thought. In the above photo, I added more foam after carving out a little to much while trying to figure out the proper fit. 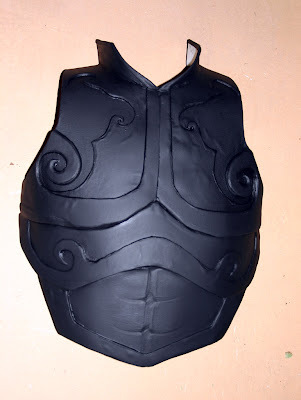 I also applied the first (of many) coat of black gesso primer to the breastplate. The plan is to complete about ten coats, then sand it smooth. I had to redo the belt buckle. I had drawn out a pattern, but between creating the pattern and building the buckle, I reversed the "depth" of the piece. The center is supposed to be raised above the sides, but somehow I got it in my head that the edges were above the middle. 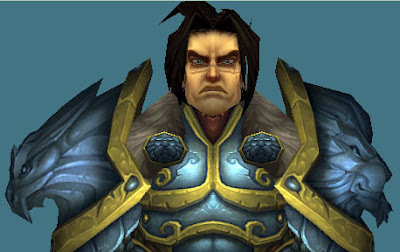 It was only after I made the post yesterday and looked a picture of the Varian Wrynn model that I realized my mistake. Fortunatly, the fix was pretty easy; took the heat gun to the higher side pieces and removed them. 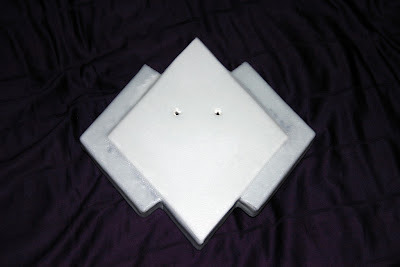 I cut a diamond of craft foam to raise the center and glued that to the buckle. Then I took scrap of Wonderflex and molded that over the top of the buckle. I have more progress on the belt to show off today. I created the rest of the buckle using craft foam and wonderflex. I am still not sure if I will include LEDs or not, but the holes are in place for the wires and there is a hollow space in the back for the battery pack and switch. I want to make sure the LED/battery circuit combination I have in mind will last long enough. My sword prop can use a 9v battery, but I cannot fit that large of a battery into smaller locations on the costume itself. 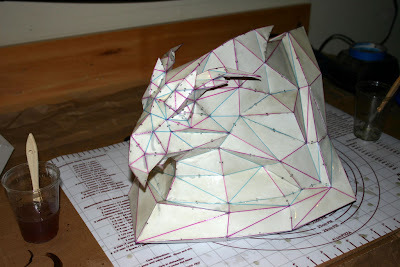 This part will be painted yellow/gold and the lion head glued in place once all the painting is complete. More progress on the belt buckle. I am satisfied with the way it is coming together. I made a similar design for the knees. At this point it is clear that I could add LEDs for the eyes, but since the character model does not have a glow effect there, I am not sure if it is nessessary. I took a photo after I applied a coat of gesso, but the black color hid all the details. 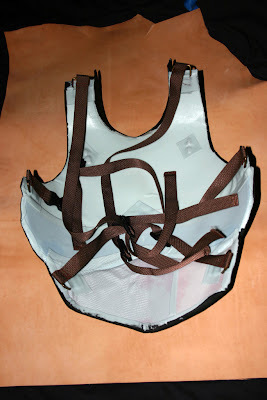 I have finished with the basic construction of the breastplate. Now I need to use scraps of Wonderflex and Friendly Plastic to smoothly join all the layers together. I had to use different color craft foam under the Wonderflex, which makes it look a bit odd. That should vanish upon painting. I also started work on the shin armor. I am using two layers of craft foam under the Wonderflex to help build details. 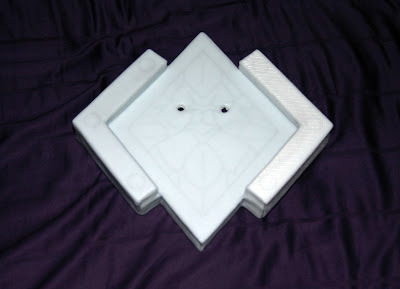 The next step is to fuse the foam between two pieces of plastic, using the heat gun. Varian wears a large belt with a huge lion head buckle. 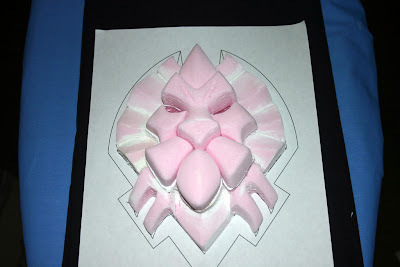 After considering several different methods, I've decided to sculpt the buckle out of pink foam. I designed a pattern (that I'll reuse for the knee pads) and I'm cutting that from foam. I'll shape it with sand paper, then paint it with gesso before attaching it to the boot armor. Progress has been made on Varian's armor. I'm constructing it out multiple layers of Wonderflex and Craft Foam. The upper part of the breastplate is nearly done, I need to add the collar and trim. Went to Gateway 2011, the Strategicon labor day convention. I was joined by two friends of mine and we participated in the day's three games together. Game One was a GURPS Steampunk, the game was run a bit to loosely for my tastes and didn't really feel like Steampunk. Game Two was Castle Faulkenstien, Steampunk before Steampunk was really its own genre. Game Three was Feng Shui, which draws its inspiration from Hong Kong action movies. I wet sanded the outside surface of the avian shoulder to get rid of the obvious drips that I let build up during the initial process. Because the resin is nearly clear, I decided to put on a quick coat of gesso to see what sort of surface I have to work with. Sadly, details in flat black don't show up all that well in the photo. I also started work on the scale armor effect for the sleeves. I'm using ink jet based iron on transfer paper. My ironing skills have a bit to be desired. Emergency at work sure cut into my costume crafting time. I was working on the fiberglass Sunday when I was called in, since then I've put in three 10 hour plus days. 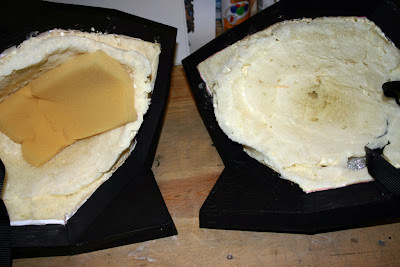 But I did get caught up, I finished the main fiberglass work on the inside. Tonight I'm going to apply one last resin coat on the outside, then this weekend I'll do some sanding to remove the obvious flaws. I'm looking forward to seeing how they look with a preliminary primer coat. Hopefully I can hide a bit of the polygon look. I'm only going to do a minimum clean up on the inside, I'll give the fiberglass about another week to cure, then I'm filling it with expanding foam. Hopefully that won't make them to heavy. Went to see Conan the Barbarian at the local Muvico with a buddy of mine. It was pretty much what I wanted from a Conan movie. It was no Lord of the Rings, but it didn't feel like an episode of Xena either. Acting was very good, it was fun to see Jason Momoa as Conan after his work as Khal Drogo on Game of Thrones. This Conan felt a bit more like the Conan from the novels and comics, with a great deal more dialog. Not to write off the Arnold Conan movies, those are classics. Stephen Lang appears to be eastablishing a legacy of playing the villain in fantasy/sci fi movies as Khalar Zym in Conan and as Quaritch in Avatar. Overall a fun film, I enjoyed it. It seemed like it took forever, but I finished assembling the papercraft lion shoulder for Varian Wednesday evening. After work on Thursday I applied two coats of resin to the new shoulder piece as well as a coat on the areas of outside of the Avian shoulder I couldn't get to previously. 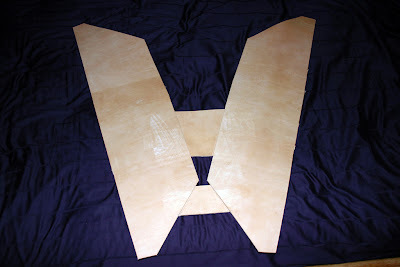 On Saturday I plan to apply resin and fiberglass mat on the underside to reinforce the whole structure of both pieces. My friend Jason gave me the Lady Vashj figure from the World of Warcraft DC Unlimited figure series 4 for my birthday. She now sits up on the shelf with the rest of the figures I have, including Amberlash, Tamuura, Valeera and Sylvanus. I embarked on my first use of Fiberglass Resin this weekend. I'm starting with the Avian Shoulder for Varian's armor. The whole process was pretty easy, although there were a number of things I had to do in preparation. I ended up ordering the resin from Tap Plastics, it was cheaper even with shipping than to buy it at the local Home Depot. On the left hand side you can see I ambitiously mixed 4oz of resin, even with a set time of 20 min, I only went through about 1oz on the first coat. I held the sacrificial paint brush in the center of the mixing cup until it set. Next I need to finish the properly scaled Lion shoulder and resin that. My Shopmaster scroll saw had seen better days. In mid-July it stopped working, the thing would hum when powered on, but nothing moved. With everything unpluged, I couldn't manually move the arm, which it normally could do. I was pretty sure something had siezed up inside either the arm mechanisum or the motor. I had been considering buying a new Scrollsaw for the past year. The Shopmaster was a good introductory saw, it made it clear it was a tool I would used regularly, but it felt limiting. I started looking around for the "next step up" in scrollsaws. 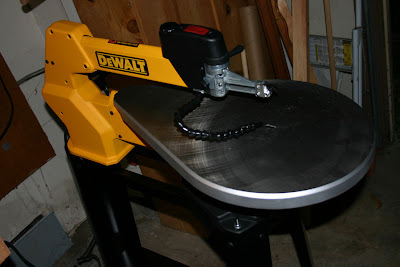 I contacted Steve Goode, over at Scrollsaw Workshop, who recommended the Dewalt 788. Which prompted further research. So this weekend my own Dewalt 788 arrived from Amazon. Compared to my old one, this is a serious pieces of machinery. It assembled rather easily, although I had to run dwon to the hardware store to get a wrench. Once in place, I fired it up and wow, what a dramatic improvement. This thing is amazingly quiet without any real hint of vibration. I didn't have any projects ready to cut, but I did a few tests and it didn't disappoint. After assembling the sword I started priming it using black gesso. I have had good luck with gesso on my wood sword props and it did not disappoint this time. After eight coats I used 240 grit sandpaper to create a smooth surface. After sanding I used food filler to repair some of the imperfections both in the wood hilt pieces and the foam blade. I sanded the filler down, then primed it again. I still have a circular piece to add to the base of the hilt and add details to the pommel and prime that. Third part of the Sibling Rivalry update on RPG Weekly. 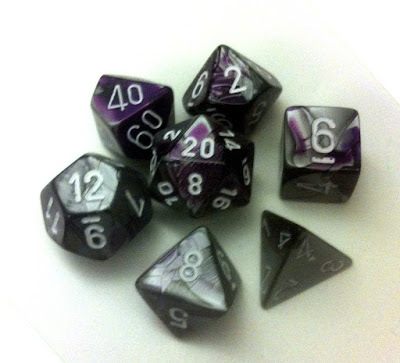 New update on the RPG Weekly site. I have a new update on my Primisiti Pathfinder campaign up on the RPG Weekly site. The yard of faux fur I ordered from Amazon arrived the other day. I'll be using it for the shoulders as well as trim on the gloves and belt. The black wig I ordered from Amphigory arrived yesterday. There is a lot of work to be done on this wing, fortunately I have a tutorial to work with. 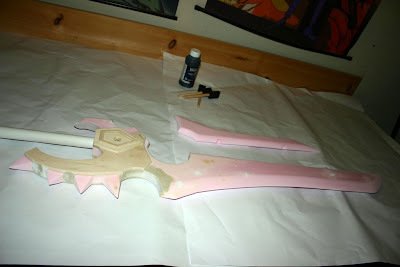 Work continues on the sword prop, I've assembled all the pieces that make up the blade; pink foam main blade, wood detail pieces at the hilt, PVC pipe handle and some wonderflex in a few spots for support. I'll be priming it with black gesso next. Check out the new blog site for Studio Hybrid. I'll be posting AMV centric news and updates to that site. Started work on Varian's Lion and Avian Shoulder armor. I was having trouble imagining how to sculpt them out of foam, so I used the WoW Model Viewer, Google Sketchup and Pepakura to create life sized papercraft of the two shoulder pieces. I scaled the lion head a bit to large (about 30% over) so I dropped the size for the avian head down and it looks spot on. 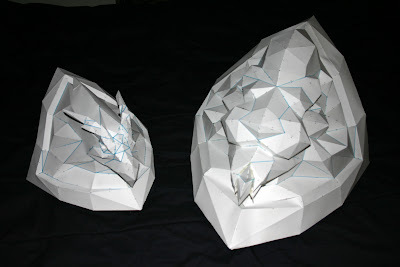 I'm hoping I can use these to help me create the corresponding foam versions. I wrote this tutorial several years ago, it was posted on the old studiohybrid.org site and as I migrate to the new blog, I don't want to loose these old pages. 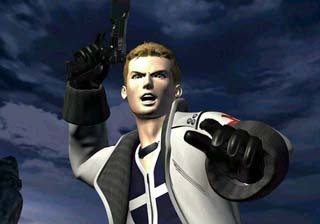 Seifer Almasy from Final Fantasy VIII wears a necklace that resembles an oversized ID bracelet. I remember seeing a version of his necklace for sale years ago, but they don't seem to be available anymore. So I needed to create a necklace from scratch for my Seifer costume, I think it turned out pretty well. This is a brief tutorial of how I created the necklace for my Seifer costume. The necklace if made from a "silver" colored plastic hair barrette by a company called Scunci, which I've seen sold in most of the grocery stores in my area. This one in particular came in a pack of 3 for $4.99, but I have seen them for sale recently for $2.99. I bought 18 inches of Hobby Chain from the local hardware store. The links in this chain have a slight twist to them, which I think both looks better and mounts better on the back of the barrette. The chain sells for about $1.50 a foot. 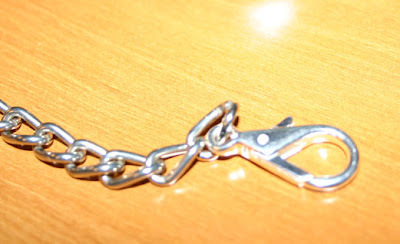 I used a Lobster Claw clasp from Michaels but you can use whatever sort of clasp you like. I wanted one that I could easily manipulate behind my neck. They're sold in a bag of a dozen, so you'll end up with a lot of extras. 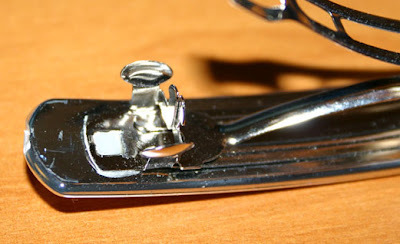 Remove the barrette from the cardboard package; you can see that a metal clasp is attached to the back of the plastic in two spots. Using a small, flat head screwdriver, pry off the metal clasp. 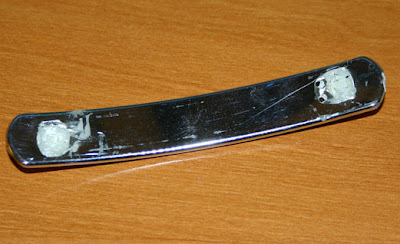 Be careful not to scratch the silver finish (cheap paint really) on the barrette. 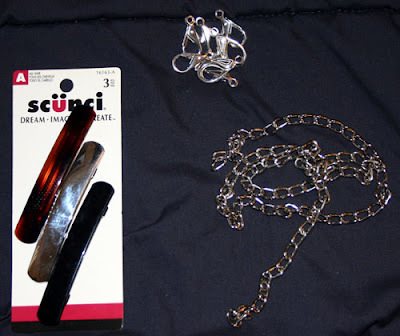 I actually practiced on the black barrette from the package, since I didn't have a use for it. 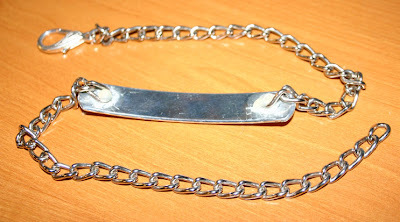 After removing the metal clasp, cut the chain in the middle to create two lengths of equal size. You're now ready to begin assembly. 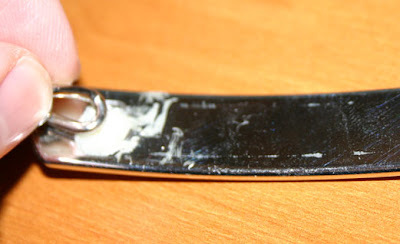 I attached the chain to the back of the barrette using superglue. 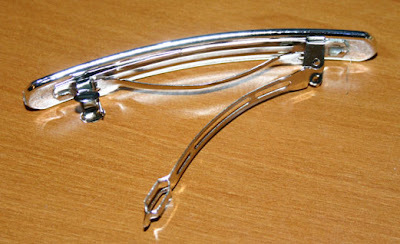 I placed one flat edge of the twisted chain loop against the same spot on the barrette that the metal clasp was glued. The other end of the loop sticks out perpendicular to the flat of the barrette. Here is one of the reasons I like this style of chain; after it is mounted this way, the chain hangs down in such a way that the barrette hangs edge down, rather than face down. I sized the necklace using a picture of Seifer from the FMV and looking in a mirror. Adjust each length of chain so that the barrette sits in the proper location, from my observation, the necklace sits on the center of Seifer's collarbone.With the chain lengths sized correctly, take in a link or two on one strand and attach the clasp. I finished it off by placing a dot of hot glue over each spot where the chain is super glued to the barrette. The final result is a pretty good representation of Seifer's Necklace. I should mention that you may want to look at the size of the barrette and make sure it is to scale with the person who will be wearing it. What looks good on me (at 6'2") might not look quite right on someone else. I hope this has been of some help, feel free to contact me with any questions.